Since Darius I handed over peacefully to his son Xerxes, there had never been another straightforward transfer of power. The Achaemenid kings often had several wives, and many concubines - and thus a large number of sons. Even if the dying king had made his choice clear, it was seldom acceptable to the other children. 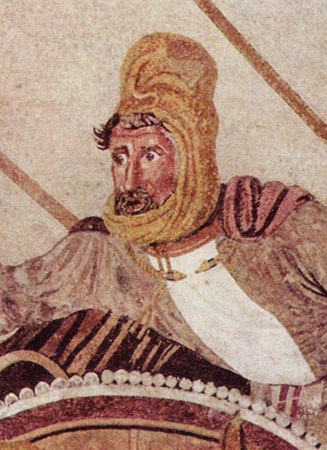 The struggle for succession became more and more brutal - and provided excellent material for Greek and Roman writers who found telling lurid tales of murder, torture and betrayal far more rewarding than trying to discover what the later Achaemenids actually achieved. Diodorus, Plutarch, Justin, Pompeius Trogus, Aelian - the list of Greek and Roman writers is long: but none gives enough accurate information for us to be sure what went on between the end of Artaxerxes II's reign and that of his son Artaxerxes III. The succession was exceptionally bloody - Artaxerxes III had to dispose of 50 of his brothers according to one writer (do we believe him?). There was definitely some sort of trouble in most of the satrapies west of the Euphrates: was it an organised rebellion seeking to dethrone Artaxerxes II? Was it just a series of local problems posing no serious threat to the empire? 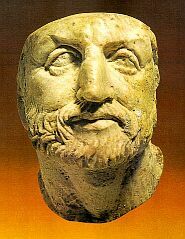 Whatever was going on, Artaxerxes III brought it under control, with the help of Greek mercenaries (who were also employed by his opponents). 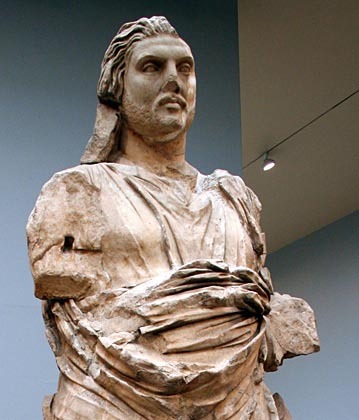 One of the satraps was Mausolus, who became satrap of Caria after the death of Tissaphernes. He played a double game, switching sides as it suited him. He was basically allowed by the Persians to act like an independent ruler. While nominally a Persian satrap, he helped Greeks who were rebelling against Persia, and enthusiastically embraced Greek culture. His tomb - the Mausoleum, became one of the Wonders of the Ancient World, and demonstrates his power and wealth. Egypt too was returned to the Persian empire after 60 odd years of struggle. Artaxerxes III, with Greece now tamed under the leadership of Thebes, and the various challenges elsewhere to the Achaemenids suppressed, ought to have been feeling secure. The empire was very much as it had been in the days of Darius the Great 150 years ago. The kingdom of Macedonia - occupied by the Persians during the early part of the war with Greece, had regained its independence, being probably thought too insignificant to bother about. The Athenians weren't even sure whether they were proper Greeks. They viewed them as politically backward compared with the sophisticated democracies further south. Macedon was a warrior society, a monarchy - the king being chosen from his fellow nobles for his prowess in battle. In many ways, it was still rather like the Greece of Homer's Iliad - seemingly not much different from the days of Achilles and Agamemnon..
Philip's expansion had been reported in Asia and the king viewed his power with suspicion. So he wrote to the satraps to help the Perinthians as much as possible. They sent a troop of mercenaries, ample funds and sufficient food, armour and everything else needed for the war. Darius III faces Alexander at the Battle of Issus. Click for the whole mosaic. Believed to be based on a 4th century BC painting - as close as we have to an actual portrait of any Achaemenid king. [In 336 BC] after the Greeks had installed king Philip as leader, he began military operations against Persia. He sent Attalus and Parmenio into Asia, gave them part of the army, and ordered them to liberate the Greek cities. 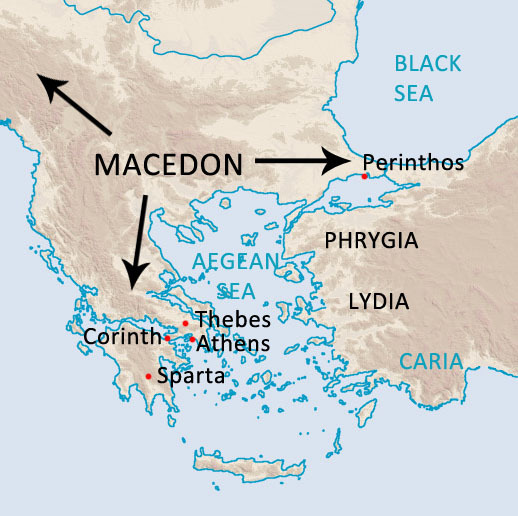 Darius' ambition was to counter-attack the Macedonians. But after Philip's death he no longer worried. He assumed that Alexander, a mere boy, would be no threat. NEXT: HE WAS SO WRONG. Artaxerxes III restores order and control in the Persian empire - only to have to face a new threat from Macedon. He succeeds his father, and is challenged by his brother Cyrus. Roman historians were also fascinated by the succession problems of the Roman emperors: from 44 BC when Julius Caesar was murdered, the leaders of the Roman world from Augustus to Nero were invariably assassinated - sometimes by their wives or mothers. Possibly this is inevitable in a family-based monarchy. "Vicious eunuchs" were stock characters in the orientalist soap-opera that Greek writers liked to substitute for accurate history where Persia was concerned. It's possible that Arses had his father murdered. "Somewhere you couldn't even get a decent slave from" according to the Athenian politician Demosthenes. Previous Macedonian kings had reluctantly been accepted as competitors in the Olympic Games - open only to Greeks (ie Greek speakers). The Battle of Chaeronea (338 BC) was a decisive victory for Philip and his 18-year-old son Alexander. It was the end of an era: the age of independent city-states competing with each other was ended for ever. The rule of Macedon was eventually replaced by Rome. Some Greek politicians had been very enthusiastic about the pan-Hellenic idea for many years (ie all Greeks band together to attack Persia). But it was never likely to happen: the Greeks didn't achieve unity until they were forced into it by Philip of Macedon. We'll hear more of these Macedonian generals, contemporaries of Philip. There were family links - Philip married Attalus' daughter (Cleopatra), and Attalus was married to Parmenio's daughter.